The College of Education hosted its 11th Annual DisABILITY Sports Festival on Oct. 7. The DisAbility Sports Festival was created by CSUSB professor of Kinesiology Dr. Aaron Moffett to increase the quality of life and health of people with disabilities. The festival introduces them to sports and physical activity opportunities, as well as educates the community. Since the leave of Dr. Aaron Moffett, the tradition has continued. It has been taken over by faculty members in the Special Education Department and one professor in the Kinesiology Department. “We want to make sure people with disabilities and differences are included. 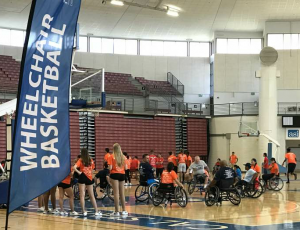 There aren’t too many events in the area that include people with disabilities or an adaptive sport,” said Marissa Congdon, a faculty director of the event. This free, one-day event, is the largest sporting festival in the western United States and is usually held during the first week of October. It is open to people of all ages with any form of disability. This event provides opportunities for people with disabilities to try 20-25 different sports and activities, and connect with local clubs, leagues, and programs in their community. “It’s good because I found out there are programs my son does qualify for. My son has autism and these programs help me to help my son,” said CSUSB custodian Jose Medina. Just like the event, registration is also free to everyone. You could register as a participant, vendor, volunteer, or coach if you have experience in adaptive sports or have specialized training in the rehabilitation field. “You get to see people that are just like you. They don’t make you feel like you’re different. You’re one big family here,” explained CSUSB student volunteer Sydnie Trostle. Early registration is always encouraged so that there is an accurate count of how many people will be attending, how many t-shirts would need to be purchased for the event and to make sure there are enough volunteers, food vendors, and emergency personnel. “I encourage people to come out and see it because we can explain it all we want, but until you see it, you don’t see how fun it is. 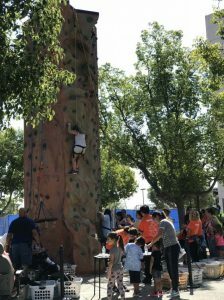 It’s nice for families to have a place to take their kids or family members where they are accepted and they can participate in fun activities and events,” stated Congdon.